I've spent many Christmases on the East Coast of the United States of (snowy) America. Though fond memories are many, one of my favourite things about a white wintery Christmas abroad is the fact Americans are so inclined to spend lots of time in the kitchen. For many, baking up sweet memories while prepping for the holidays is just a given. Kids give homemade edible gifts to their teachers, neighbours share home baked trays of turtle brownies and pumpkin pie, and cookie exchanges are in full swing. While holidaying with my awesome cousins in Pittsburgh, I became so inspired by the love that went into homemade gift giving, that I swore I'd bring the tradition home with me. So for the past few years, I have made it a point to do more of two things: one includes a get together with my family to hold an annual Christmas bake night with all my nieces and nephews. The kids adore this family gathering, as it's their only excuse to get covered in icing sugar and eat fresh gingerbread cookies all night long without mum saying a word. The other thing that I brought back from my time with my family in the US is my obsession with chocolate bark. 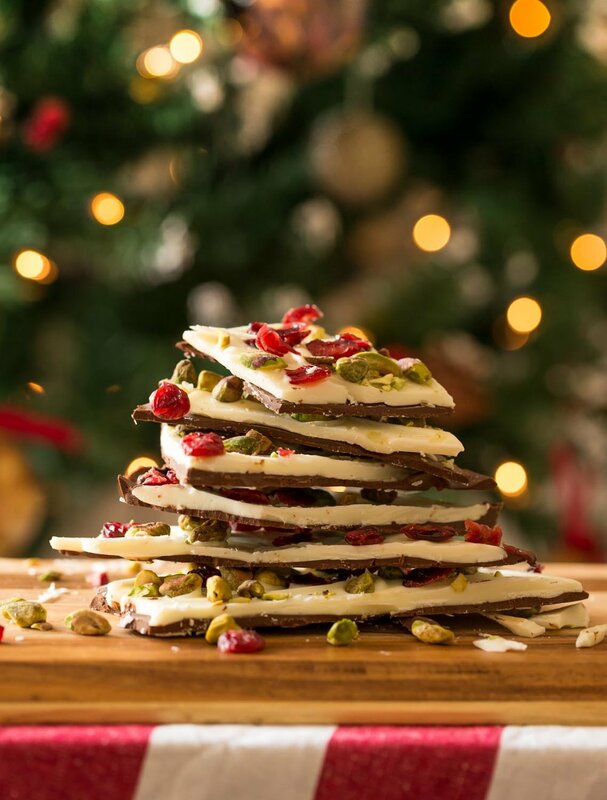 One of the many great things about chocolate bark, is that it does not require baking so it's quite perfect for the Aussie Christmas climate. Here's my recipe for the most delicious edible gift, thats coloured oh so perfectly with Christmas red and green. But don't hold back - Americans are known to add all sorts of treats to chocolate bark like candy canes, pretzels, cookies and marshmallows. Yes I know, its heavenly. Line a large cookie sheet (or baking tray) with baking paper and set aside. Pour the dark chocolate over the lined cookie tray using a spatula to distribute the chocolate evenly over the whole tray. Set aside. Pour the white chocolate over the dark, and using a clean dry spatula distribute it evenly – now working very quickly before the white chocolate solidifies – sprinkle the pistachios and cranberries over the entire surface. Place it into the refrigerator for around 45 minutes and allow to set. Once the chocolate is firm, break into large pieces and you’re set to package the most wonderful festive gifts!